Previously, we talked about what a business continuity plan (BCP) is and why you need it. This time we’ll talk about what exactly should be considered when you’re making the plan. An effective business continuity plan is more than just the result of effective backups and data replication. A business continuity plan must be based on both sound knowledge of your organization’s culture and structure, and also on well-defined policies and procedures that make the plan a part of your daily operations, rather than something that is referred to only in the case of an emergency. Integrating risk strategies to optimize resources. Providing data protection, privacy and security. Achieving and maintaining operational planning. Maintaining disaster readiness and preparedness. Damage assessment and insurance claims processing. Banking, including payroll and emergency cash access. Human resource systems that include payroll, personnel and tax information. And don’t forget that each department has its own unique set of procedures that are critical to your business’ mission. Is your organization ready for a major disaster? 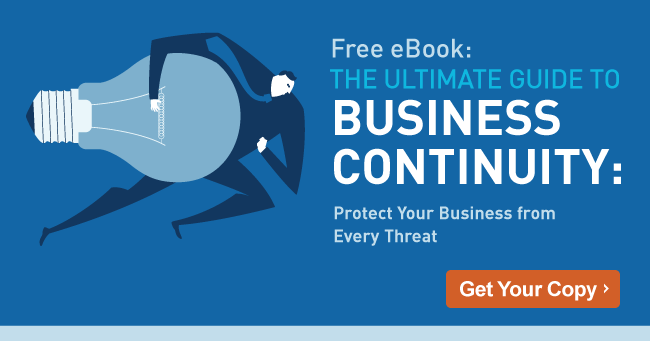 Get your copy of the “Ultimate Guide to Business Continuity Planning” and prepare your organization’s documents for a disaster.